During World War II, Roy "Pappy" Farrell and Australian Sydney "Syd" de Kantzow became friends while flying the most dangerous route in the world - the terrifying "Hump". 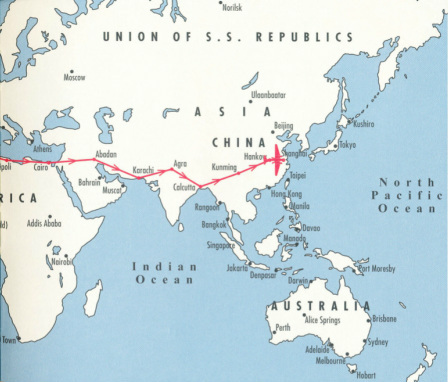 This aerial route, from Dinjan in Assam to Kunming in western China, became legendary for replacing the fabled Burma Road that the advancing Japanese had closed by invading Burma. Every day, in fair weather or foul (usually the latter), young pilots battled through the spurs and mountain passes of the lower foothills of the forbidding Himalayas, bringing the supplies that kept the harassed forces of China's Generalissimo Chiang Kai-shek fighting. Some of these supplies went to American General Clare Chennault's famous "Flying Tigers". In this atmosphere of uncertain survival, Pappy and Syd mapped out their post-war future. Their plan was to sell luxury goods to the people of Southeast Asia by using a ship to import goods from the West. However, when Pappy tried to obtain a suitable vessel after the war, nothing was available. Common sense convinced him that an aircraft was a better alternative. This photo, in glorious colour, comes from Capt. 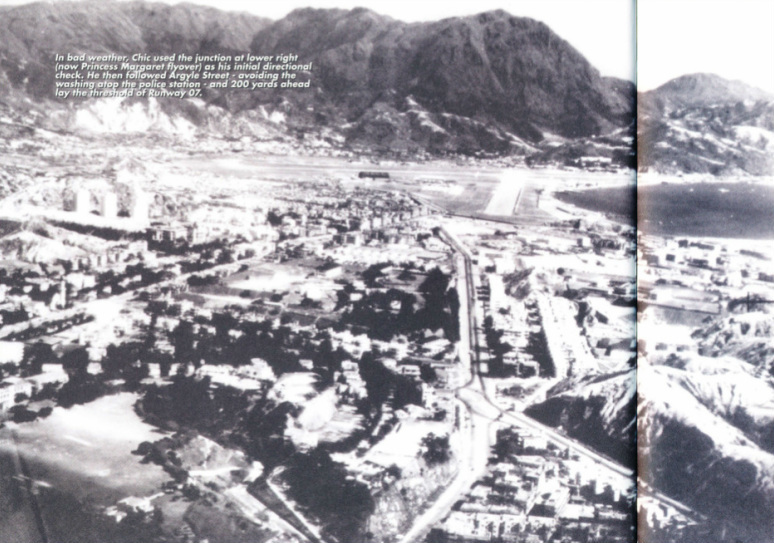 Martin Willing’s splendid booklet BETSY – The story of a DC3 – it is C47 No.41-18385 that in another era became VR-HDB or BETSY, the first plane owned by the Roy Farrell Export Import Company that evolved into Cathay Pacific Airways. Martin’s caption speculates the photo was taken when she was based at Pope AFB North Carolina under Glider-towing training for the invasion of North Africa. Martin credits the photo to Harry Gann, Douglas Historian. With sparkling eyes and boyish enthusiasm. Capt. Roy Pappy Farrell and F/O Bob Russell begin the flight from New York to Shanghai 15th December 1945 to 9th January 1946. Betsy, arguably better known than her twin sister Niki, was born on the wartime Douglas production lines at Long Beach, USA in 1942. She was allotted the USAAC serial number 41-18385 and was finished two months later. Her military fit-out was completed at Mobile Air Depot in Alabama and she was ultimately assigned to the invasion of Europe, having survived the North African campaign. Pappy bought C-47 No. 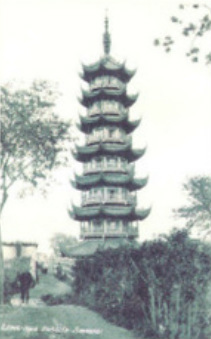 41-18385 for US$30,000 on October 10, 1945 from the Reconstruction Finance Corporation in Washington. Her condition at sale varied from "a real good one" to an oil-stained and deceptively camouflaged scow of questionable antecedence and dubious age. The only general point of agreement is that a case of Johnny Walker Black Label Scotch whisky was prominent in her purchase. Yet, when Pappy first saw her, his pride of possession far exceeded his doubts. Following civilian certification, she was registered NC58093 and the story that would bring her aviation immortality as Betsy began to unfold. Betsy's flight path from La Guardia Field N.Y. to Lunghua Airfield Shanghai. The frosty dawn of December 15, 1945 had Pappy warily circling his aircraft forlornly parked outside a TWA hangar at La Guardia Field, New York. 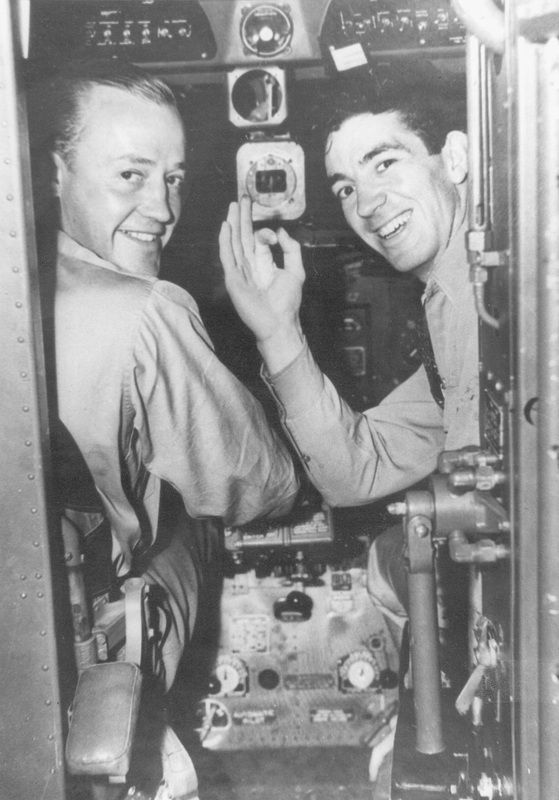 Within moments of beginning his pre-flight check, he was joined by co-pilot Robert Bob Russell. Bob latched the cargo door and followed Pappy as he clambered over a mountain of freight that filled the fuselage. The load sheet stated that they were within loading limits and correctly trimmed for Centre of Gravity. In reality, at 33,000lb the plane weighed some 6,000lb above the legal limit, and her correct Centre of Gravity was anyone's guess. By the time they had taxied into take-off position, the hesitant sun had burned away the haze to visibility unlimited, and a climbing turn put them on a course for Palm Beach, Florida. They had started the long haul to Shanghai, with a diversified cargo including everything from lipstick and toothbrushes to bales of used clothing. 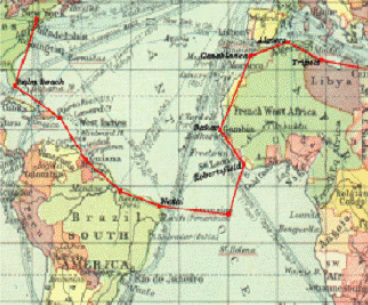 Map shows the routing from New York to Cairo. 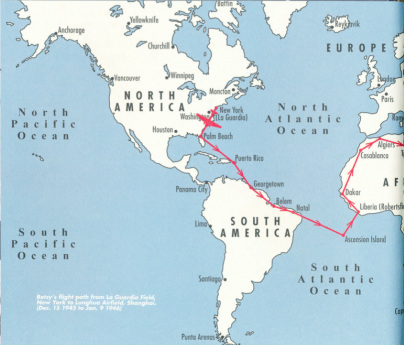 The concluding routing of the initial Roy Farrell Export Import Company’s flight. In the cold, crisp air, Betsy performed like a thoroughbred and they enjoyed a trouble-free trip to Palm Beach. There, navigator Bill "Ged" Geddes-Brown joined them for dinner and, realising the enormity of their enterprise, they retired early. The next day found them en route to Borenquin Field, Puerto Rico where they refuelled. They made a technical stop at Georgetown in British Guiana, and by mid-morning of December 17 had arrived in Belem, Brazil - thoroughly clapped out. With the problem sector ahead, they headed for the sack and did not stir until Pappy woke them before dawn. Following another stop in Natal, Brazil, the transatlantic sector was to be the decisive test, but Ged had navigated it several times as a war ferry navigator and shrugged off the dangers. In the middle of the Atlantic Ocean, he had to hit a mere dot right on the nose, and true to his ability, Ascension Island shimmered into view after several hours. Ascension Island had become a vital Allied staging point when the German blitzkrieg overran Europe. With the fall of France, the American-based British Purchasing Commission placed massive orders for aircraft. Shipping problems combined with dismantling and reassembling slowed the delivery of these aircraft to a trickle. Beginning in June, 1941, the Allies decided to fly all planes with the necessary range from North America to the Middle East via South America, stopping off at Ascension. This was the island's greatest hour. By the time Pappy and his crew landed there, however, it had returned to a sleepy hollow, a habitat for sooty terns. It is doubtful that the Farrell crew had such birds on their minds, and buoyed by their progress, they refuelled. Eight hours later, they touched down at Liberia's Robertsfield. They passed through Dakar in French West Africa, and then spent a day in the ancient Moroccan city of Casablanca. Soon after the witching hour on December 23, they departed for Algiers. The breaking day found them flying an easterly course along the North African coast, while below was a scene of unbelievable war devastation and carnage, with mangled tanks and trucks littering a vast area. The crew arrived at Tripoli's Castel Benito Airport just before noon, each man gazing inwards in a thoughtful and dazed state. None of them could come to terms with the sights that they had just witnessed. Yet more of the same awaited them as they crossed battle-hardened Tobruk and El Alamein en route to their next landing. Shortly after dark, they landed at Cairo where their request to fly on to Jerusalem was denied. They spent Christmas Day touring the Egyptian capital. On the night of December 26, they left Cairo for Abadan in Iran, following the traditional pipeline route from Sidon to Basra. From 100 miles away, the huge oil-field flares led them to the threshold of the Abadan runway. After a quick refuelling, they were bound for Karachi, landing there before noon on December 27. The next day found them circling the glorious Taj Mahal before touching down at Agra. 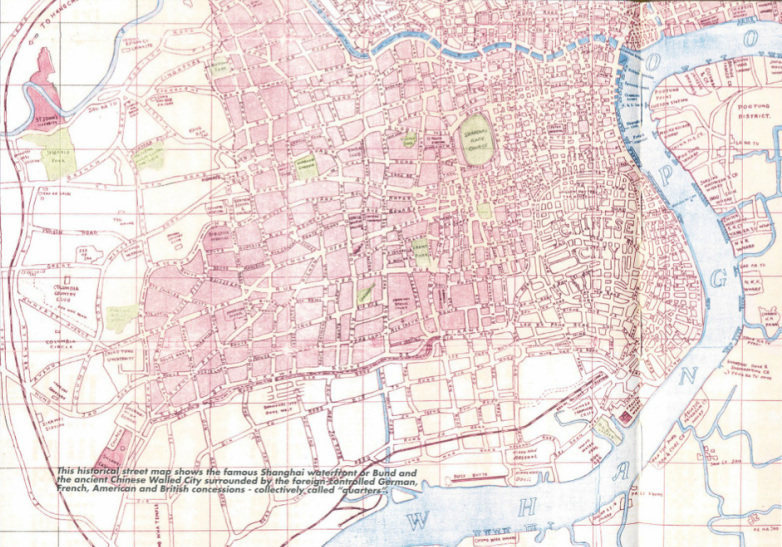 This historical street map shows the famous Shanghai waterfront or Bund and the ancient Chinese Walled City. On the January 3, 1946, this veteran of "The Hump" eased his overloaded plane up to 17,000 feet and sucked oxygen from a tube. Soon he was in a familiar environment, fighting heavy turbulence, severe icing and torrential rain. His hands moved from control to control as fast as the lightning that bolted around his plane. When the elements realised he could not be frightened, the weather suddenly cleared and the view into Kunming was glorious. The next morning, Pappy bundled his crew into the transport, anxious to get going for the final part of the trip, but his haste was short-lived. As he opened the plane's cargo door, he found his priceless freight missing. 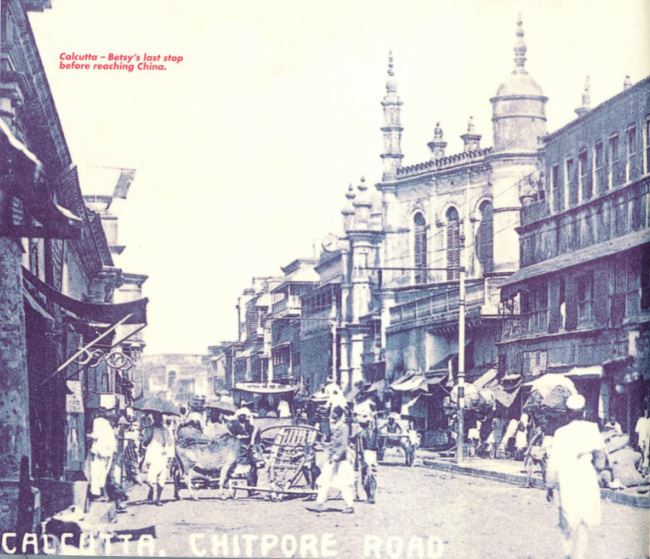 After three days, the police had found no trace of the thieves and, on January 9, he opened the throttles and headed for Hankow. There he found no worthwhile information about his Shanghai destination but decided to proceed. As they neared Shanghai, they intercepted a radio message that Lunghua Airfield was experiencing typhoon winds and heavy rain. Pappy told the ground operator that he had little fuel and could not divert, suggesting that the operator hold down his transmitter and he would home onto it. Using an old Pan Am trick, he timed his legs and with wheels down and flaps fully extended, he saw to port the dim lights of the runway. He screwed left and thumped his plane onto a stormy runway. Nobody had the strength to applaud his masterly feat of airmanship. The flight was a success, and despite having no cargo to offset their costs, Pappy saw a bright spot - the kids were home! "All that is behind us," he said. "Now let's get to work!" 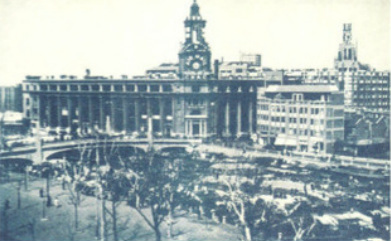 On February 4, 1946, under the management of Ged, the Roy Farrell Export-Import Company established itself in downtown Shanghai. With its plane based at Lunghua Airfield, the company was making money, and after several return flights to Sydney their profit margin was spectacular. This prompted Pappy to look around for an additional plane. 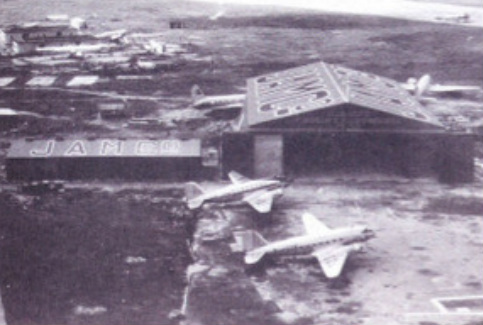 That proved a simple task, for the Foreign Liquidation Commission (FLC) had an office on Lunghua Airfield. In early April, he acquired from the FLC a C-47B that carried the number 44-76659. In his haste to get her working, he despatched the plane to Sydney where she ran afoul of the Department of Civil Aviation. It insisted she should be civilianised and issued her with the temporary registration VH-ASJ that was fully approved the following June. And so the legend that would become Niki was born. It was during those heady days that Pappy made contact with his wartime friend Syd de Kantzow, who was in Australia but eager to join the action in Shanghai. Before long, John "Pinky" Wawn, Milton "Nash" Nasholds, George Peter Hoskins and other long-time friends were also reunited in the city. 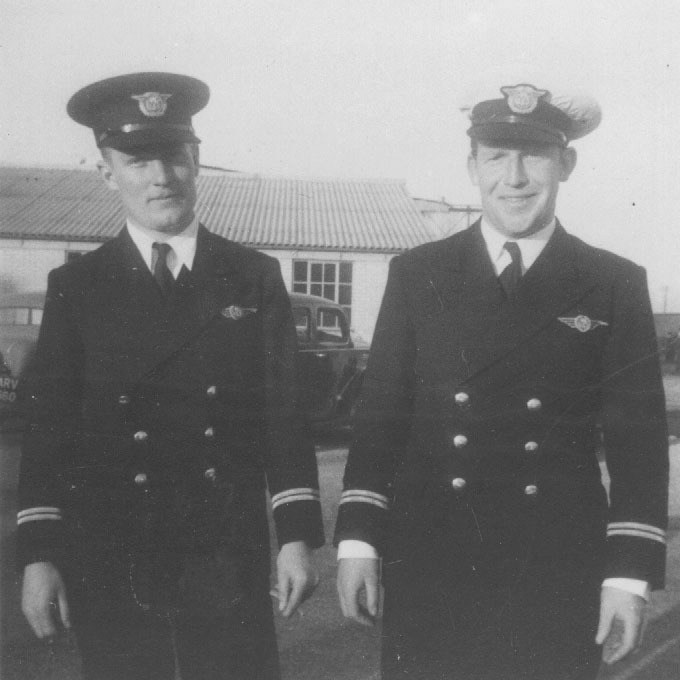 Junior Captains Syd de Kantzow and John "Pinky" Wawn in their Southern Airlines (UK) uniforms, March 1939. 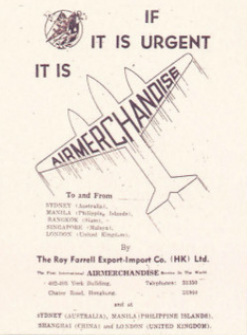 Roy Farrell Export - Import Co. (HK) Ltd - the first "Air Merchandise" service in the world. The pre-departure press conference at Kai Tak Airport of the First Airmerchandise Service between Hong Kong and the United Kingdom that was established on 28th October 1946. From Left to Right: Radio Officer Alex Stewart, Public Relations Officer Bill Dobson, several reporters, Capt. 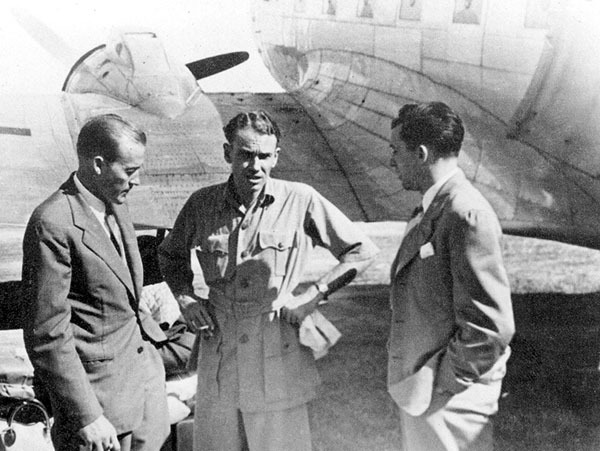 Neville Hemsworth, First Officer Bob Donovan with Capt. Roy Fallell guiding their words. A very rare picture of the Tent City fills the background. Things soured for the fledgling company when a prominent Shanghai figure, who coveted its money-making possibilities, made a partnership proposition. Pappy declined the offer and from then on things only got worse: mislaid bills of lading, customs checks that caused days of delay, customs duty on items that were once free, engineering disapprovals, and so on. Finally, Pappy clandestinely loaded both his planes with engine spares and general office equipment and, under the cover of a misty dawn, left Lunghua Airfield and landed at Hong Kong's Kai Tak. In bad weather Chic used the junction at lower right (now Princess Margaret Flyover) as his initial directional check. He the followed Argyle Street - avoiding the washing atop the police station - and 200 yards ahead lay the threshhold of Runway 07. A.J.R. 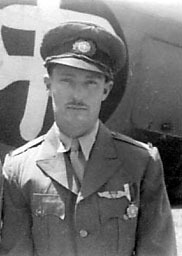 Papa Moss, Director of Air Services 1946-48. 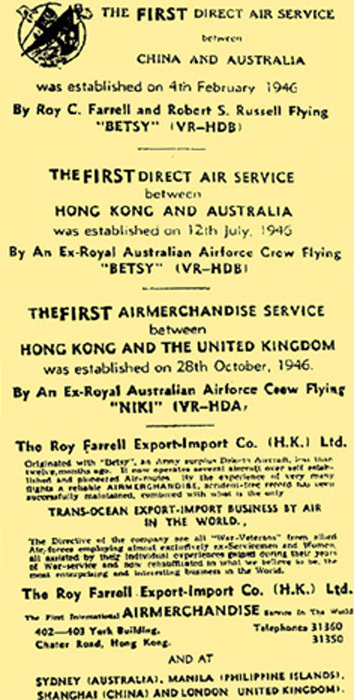 The success of the Roy Farrell Export-Import Company (Hong Kong) Limited depended on a good relationship with the Director of Air Services Mr. Albert James Robert "Papa" Moss. This proved no difficult task, for Papa, himself a rebel, had fallen in love with Syd and his "pirates". 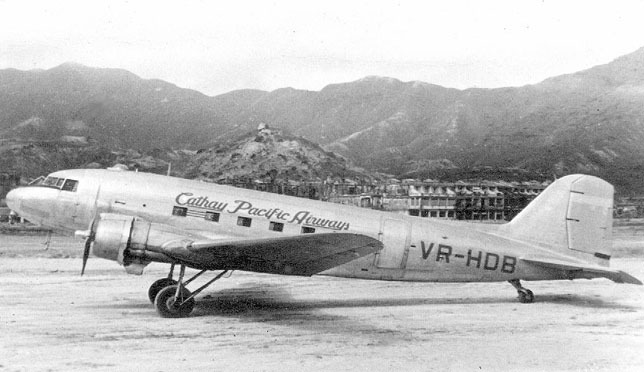 At a meeting with Neil Buchanan, Papa told him frankly that future flight approvals depended on Farrell registering both a company and its planes in Hong Kong, and so on September 24, 1946, Cathay Pacific Airways Limited was incorporated. It had a nominal capital of HK$5,000,000 in the form of 5,000,000 shares, each valued at a dollar. The directors were Pappy, Syd and Buchanan, and office space was leased in the premises of P. ]. Lobo and Company, Chater Road, Hong Kong. Jardine Aircraft Maintenance Co. Ltd, Kai Tak, 1949. 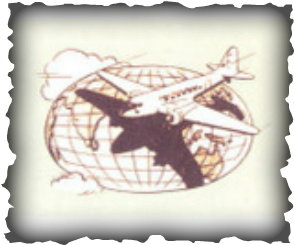 JAMCO amalgamated with PAMAS in November 1950 to become HAECO. 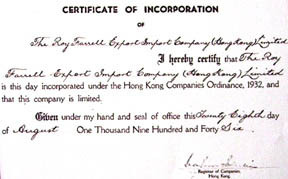 The Roy Farrell Export Import Company’s (Hong Kong) Limited Certificate of Incorporation dated 28th August 1946. 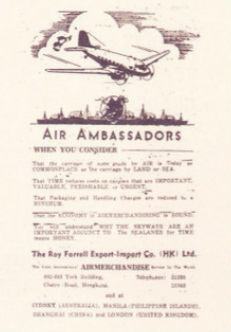 The famous South China Morning Post advertisement dated 2nd December 1946 that gave, in a nutshell, the early flights of the Roy Farrell Export Import Company. 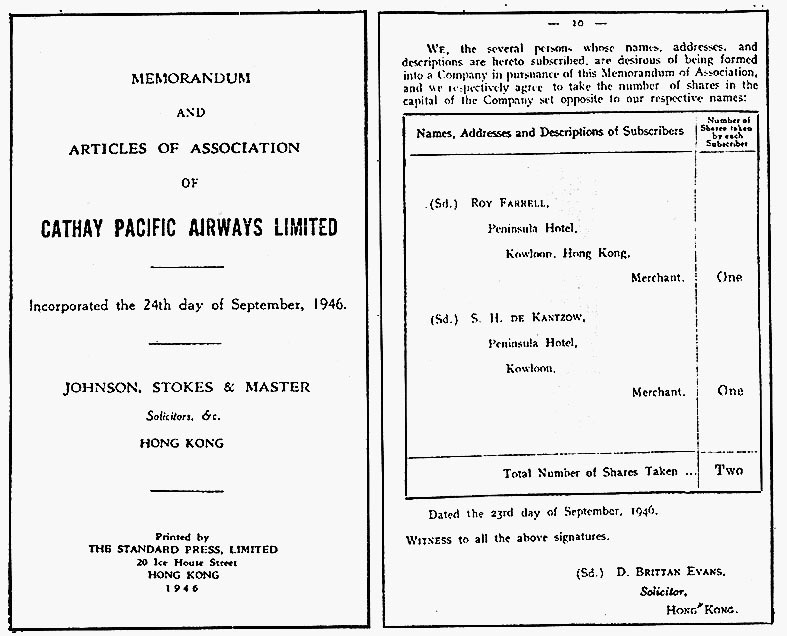 Pages from Memorandum and Articles of Association of Cathay Pacific Airways Limited. Incorporated the 24th day of September 1946. Niki and Betsy were entered on the Hong Kong Aircraft Register on October 3, 1946 as VR-HDA and VR-HDB respectively, and were the first aircraft registered since the end of World War II. VR-HDA (NIKI) and VR-HDB (BETSY) Cathay Pacific Airways first aircraft 1946. Cathay Pacific Airways' inaugural flight to Singapore via Bangkok on December 9, 1946 had standing room only. Syd arrived at Kai Tak Airport in a flurry of dust and burnt rubber to find that an enthusiastic ticket clerk, drunk on power, had sold his seat, but noting the steely glint in his managing director's eye he quickly reversed that decision. When Niki departed, Syd was comfortably strapped into his seat, and she rolled onto Singapore's Changi field right on the dot. 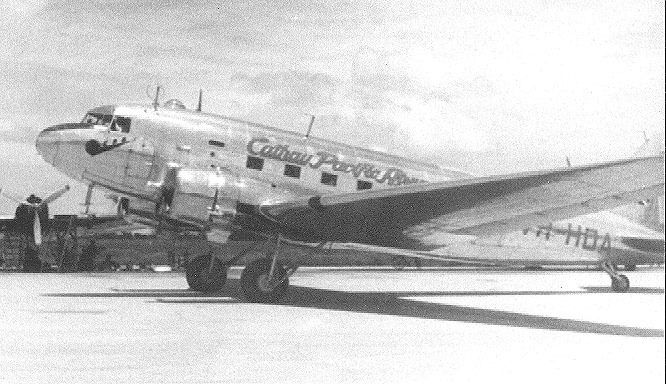 As a civilian airliner it was a DC-3, "DC" standing for "Douglas Commercial". 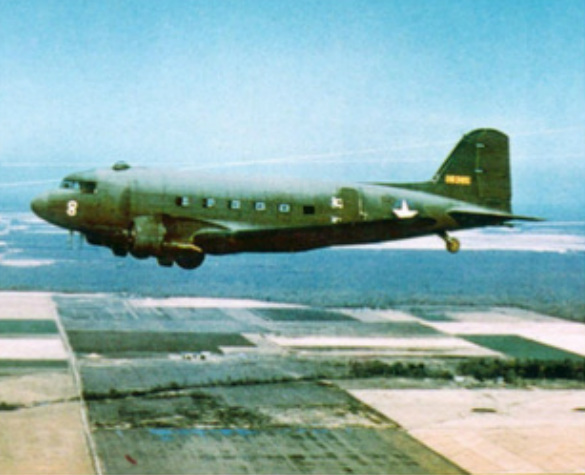 In American military service, with a reinforced floor and a double cargo door, it was a C-47, officially named "Skytrain" or, more casually, just a C-47 or a "Gooney Bird". When supplied to the RAF it became a "Dakota" or sometimes just a "Dak" for short! Post-war, with thousands of aircraft on the market, the venerable C-47s, Skytrains, Gooney Birds, Dakotas and Daks (and numerous other derivatives), formed the backbone of the re-emerging civil airline industry. Often, civilianised and virtually indistinguishable from one another, and regardless of their true origins, they were referred to again simply as DC-3s - the planes that changed the world.